I was very lucky this year as far as receiving presents. Louise (M3TLL) my lovely YL got me something that she new would be well received and appreciated more than most things, which was of course some Ham Radio equipment. Thanks Lou! Louise managed to get a good deal from our local Ham Buddy – Adam 2E0LXA, who had a great little Yaesu FT-817, QRP multi banded/mode portable transceiver that he was selling. The little rig came with a “Miracle Antenna” and a “Wonder Wand” tunable counterpoise which I have already tried successfully on 5Watts making QSO into Estonia as well as across the Atlantic into the US. I must admit I was surprised with the performance of the Miracle Antenna and I am looking forward to getting out with the portable QRP station and finding out what the possibilities are with a simple QRP set up, as well as using the rig outside on the Satellite’s. I have already been trying the standard rubber Whip (YHA-63) connected to the BNC located on the front panel, I worked my local buddies M0DIT, M1PAC and M3RIZ who are all around 6 miles away over in Keighley. This was done whilst walking the Dog Dudley, the FT-817 was working well whilst running off the battery pack with 5/9 reports exchanged on 2M FM. I am very pleased with this years Christmas present and should get many years of use out of it, money well spent! I was also lucky enough to receive some cash from the family which I put too and invested in a backup 30Amp Power Supply Unit (PSU), which I had been considering for some time. So we headed into the City (Bradford) for a visit to Maplin Electronics where I picked up an Identical model to the original PSU in the shack. The new PSU can be seen in the background of the picture as well as via the link. Hope you all had a good Christmas and are ready for the New Year. Christmas is upon us once again and it the time of year when Santa has a lot of presents to deliver, so as usual Dudley our four legged friend will be busy lending Santa a Paw. 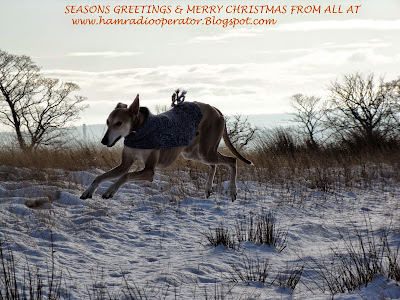 The picture was taken earlier today when Dudley suddenly flew off in the direction of Lap Land where Santa is awaiting the annual return of all his helpers. So if you leave out any mince pies for Santa tonight don't forget to leave a couple of gravy bones for Dudley, Rudolph and the rest of Santa's helpers. I hope you all get some nice presents and have a Merry Christmas! Despite the snow continuously falling up here on the Moor top and both Louise and I feeling full of cold, the water supply being frozen solid - BAH Humbug! I have still kept up with my usual radio antics whilst trying my best to keep us both warm and comfortable. I have been playing around with the Radio Com software that I have had installed on my machine for the last 4 years which is proving to be unbeatable for decoding the NOOA WX SATs. This time I have been using the software to monitor the new Chinese Satellite - XW-1(HO-68). The Sat is still mainly beacon only, which transmits around 435.790MHz in CW mode. I use the Ft-847 and IO-10El antenna to receive the "bird" feeding the incoming AF from the rig to the computers sound card where the Radio Com software picks up the audio to be decoded. The software works similar to any other radio decoding software having lots of nice and useful features. The Spectrum Analyser is one of the many useful tools, in this case used to visually observe the new "birds" signal whilst decoding the received beacon's CW transmission. The HO-68 Satellites beacon is reported to be strong world wide from the various reports from other Hams and relevant sources that I've come across on the net. As you can see from the above image I am also receiving the Hope Oscar 68(HO-68) beacon very well and I am looking forward to hearing some real activity via the new "bird" soon. 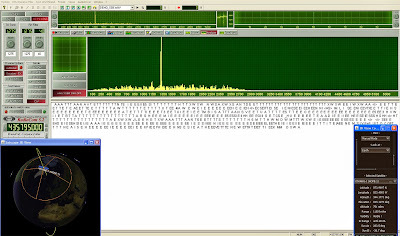 The CW TX from the HO-68 Satellites beacon was decoded by the Radio Com CW decoder which reads. If you haven't yet heard the XW-1(HO-68) Satellite yet, or are new to Satellites and don't know how to track them. Have a look at downloading Satscape to help you locate them. The rest off you G L, & have a Merry Christmas. As an avid Satellite Operator Santa has come early for me, I am referring to the exciting news from AMSAT China regarding the recent successful launch of their very first Amateur Satellite XW-1. XW-1 payload was deployed by the CZ-4C rocket from the Taiyuan Satellite Launch Center earlier this month and is currently commissioning in a sun-synchronous orbit at about 1200KM, ASL. I am looking forward to hearing XW-1 on my FT-847 and IO-Ten El Sat antenna and with 1Watt of output PWR it should be nice and loud once the AMSAT Teams finish their preliminary settings and testing. In the meantime I will be keeping an eye on twitter for further updates and developments that are regularly tweeted from AMSAT. Another excellent source of all the latest AMSAT and General Satellite Information is observations which constantly gets updated by AL – GM1SXX and many of the other experienced Satellite Ham Operators. With the IO-Ten Element Satellite antenna working so well since I put it up, I decided to have a another shot at making a video demonstrating just how easy and uncomplicated it is to be able to work the Low Earth Orbiting SSB Sat like VO-52. Hope you enjoy the video and look out for the Festive hat. 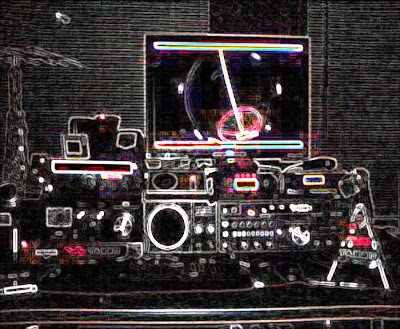 Whilst SWLing the HF bands each evening, I had a play around with Adobe PhotoShop CS2 and came up with this funky cyber shack. I enjoy the SWL side of Ham radio just as much as actually transmitting my own signals, I like tinkering around with the PC at the same time as keeping a close watch out for interesting signals. As you can see with the above image, I had a mess with some of the filters, which is pretty straight forward enough. Basically I was just messing about and having fun whilst listening to fellow Hams. Oh yes, I could not resist working a couple of interesting Stations at the same time. The Toyota mobile Ham station has been working amazingly well since I knocked up the roof-bar mounted stainless steel antenna brackets. The reports and results that I've received have made me realize the benefits of running 50W /mobile into 3 meters of 50 ohm low loss coax. A nice and simple set up with low losses with a well grounded rig/antenna to the vehicle chassis combined with a modest antenna is a very effective way to put out a good signal, as I have been finding out over the past 6 years. With the Yaesu FT100 set at 50W I can operate continuously when the vehicle engine is running, but the Toyota 2.0 Litre Petrol 4X4 needs a 45AH battery to power its creature comforts, which get a bit of a hammering during these wintry months. So, I decided to replace the battery with something that would give me a bit more Umph, for both the Toyota and the amateur radio equipment carried on board. I picked up a heavy duty replacement 65AH battery, which will give me a few extra amps for a lot longer. The mobile station is now at 100%, firing on all four cylinders! Listen out for 2E0HTS/M somewhere on 20M. Have a nice weekend.